Its apparent heading into this weekend the drivers will be facing several unknowns at the newly minted Charlotte Motor Speedway Road Course. But that won’t slow down the intense action that has been bubbling up in this season’s NASCAR Xfinity Series Playoffs as the series readies for the wild card that is the Drive for the Cure 200 presented by Blue Cross Blue Shield of North Carolina, this Saturday, Sept. 29 at 3 p.m. ET on NBCSN, PRN and SiriusXM NASCAR Radio the second race of the Round of 12 in the 2018 Playoffs. In stylish fashion last weekend, Christopher Bell nabbed the first win of the Xfinity Playoffs at Richmond Raceway, and in doing so locked himself into the Round of 8, leaving 11 other drivers vying for the remaining seven spots. This weekend, the 12-driver Playoff field will compete on the Charlotte Motor Speedway Road Course for the first time in series history. The Charlotte Motor Speedway Road Course is a 2.28-mile, multi-elevational track that has 17 turns. This weekend’s race will consist of 55 laps for 200 kilometers, or 125.4 miles, and is broken up into three stages. The first two stages will be 15 laps each and the final stage will be 25 laps. The Charlotte Motor Speedway Road Course will be the fourth different road course the NASCAR Xfinity Series drivers have competed on in 2018; joining Mid-Ohio Sports Car Course, Road America and Watkins Glen International. The 2018 season is the first time Charlotte has hosted the second race of the Xfinity Series Playoffs. Prior to Charlotte being named the host of race No. 2 in the Playoffs, it was held at Dover International Speedway in 2016 and 2017. NASCAR Xfinity Series Playoff contender Daniel Suarez took home the win of the second race in the 2016 Playoffs at Dover, and later went on to win the title that season. 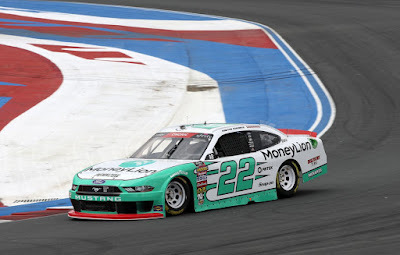 In the 2017 Playoffs, non-Playoff contender Ryan Blaney won the event. Road courses have been known to provide some great unpredictable action and even first-time winners. Over the last decade road courses have produced nine Xfinity Series first-time winners. This season, Playoff contender Justin Allgaier has dominated the road courses winning two of the previous three (Mid-Ohio and Road America); Joey Logano won the third at Watkins Glen International.